Carol Susan Jane Danvers is the Avenger formerly known as Ms. Marvel, now flying the skies of Seattle under the name Warbird. Warbird is currently on an extended leave of absence from the Avengers, due to health problems. 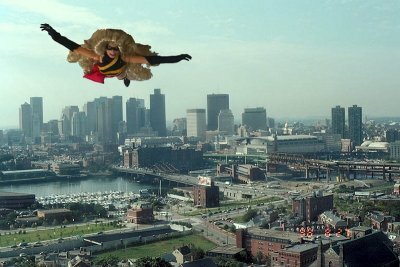 Born in Boston -- her parents still live in Charlestown, near Bunker Hill -- Danvers was a USAF Intelligence officer who, in an adventure with the renegade Kree captain Mar-Vell, gained essentially a hybrid human/kree genetic code, gaining super strength and the power of flight. Although her primary base of operations as Ms. Marvel was New York City, she has recently re-located to Seattle, where she has become friendly with Tony Stark. She was recently seen fighting alongside Iron Man against War Machine. Ms Marvel is a Black Widow. The costume is cut back from the original Black Widow costume. (Actually, I over-did the cutting back and ended up having to give it a new front panel of black swimsuit lycra.) The yellow "swoosh" is cut from yellow swimsuit lycra and superglued on, with one helpfull little stitch. 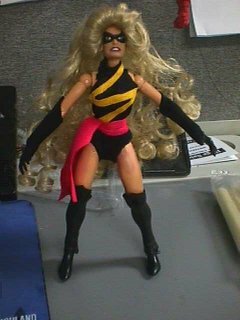 The boots are Storm's with black swimsuit lycra behind the top to cover the holes. The sash is red swimsuit lycra. 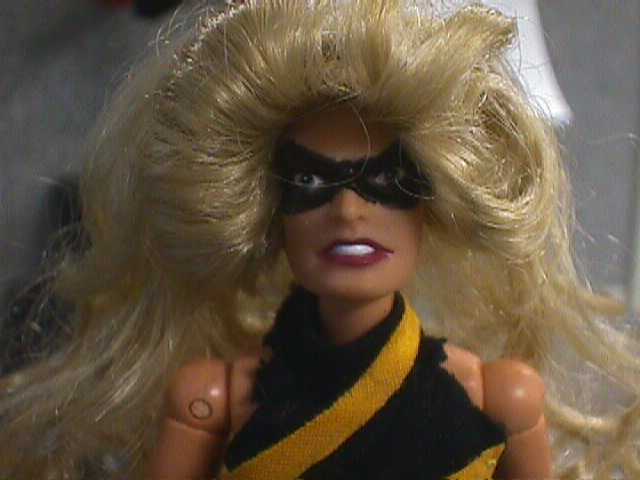 I broke one of my usual rules -- I'm generally a maniac about removable masks -- and drew the mask on with a Sanford "Sharpie" permanent black laundry marker; there was not way to get a removable mask around that hair! Oh, yes! The hair is a "Blond Wiglet" from the dollmaking supplies in the "Crafts" section of my local "Ames." I shaved Natasha's head, and sewed the wiglet directly onto her head. (Hmmm.... Making a custom because I had a crush on her in my adolescence, so therefore I stick needles through her head. Yeah, that seems right....) It looks a little bit too "Farrah-esque," look.